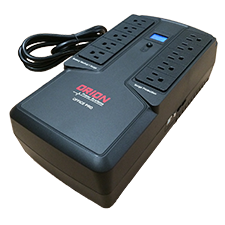 UPS systems from Orion are manufactured to ISO:9001 standards and cost 30-40% less than other big name UPS brands. Optiview is a proud provider of these power supplies that have applications for small home office computers and recorders to PCs, servers, DVRs/NVRs, network switches, hubs and file servers. All five UPS products carried by Optiview provide excellent protection. The UPS600 and UPSPRO models output a stepped square wave on battery, this type of wave form is much cleaner than a low quality and cheap UPS alternative which uses a regular Square Wave. The stepped square wave products are not recommended for long run applications, but are an ideal for buildings with back-up generators and for providing time for users to save and quit programs on personal computers or servers. The UPS1000RM outputs a true sine wave at all times and is ideal for rackmount and mission critical applications. 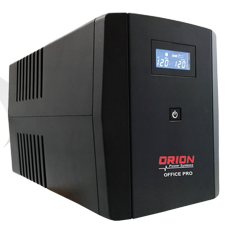 Optiview is an Authorized Orion partner and can help with UPS solutions from 600VA to 20kVA. Every Orion UPS comes standard with a 37 month warranty - check the Orion website for more details. If you do not see what you are looking for or need, contact us via phone at (904) 805-1581 to find out what we have available, pricing and turn around time.